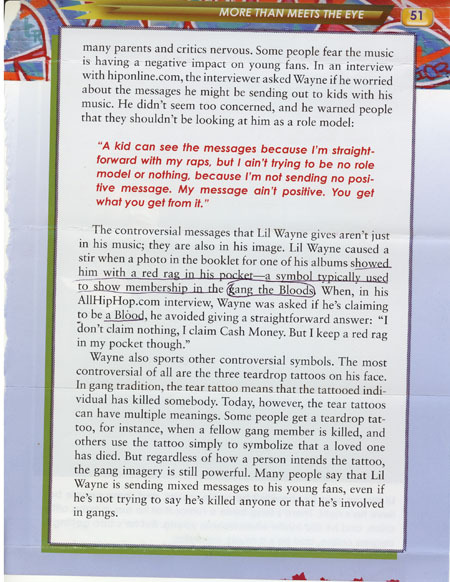 I included two pages of a book titled "Hip Hop Lil Wayne", by Janice Rockworth [see below], which the library is issuing out for prisoners incarcerated at Red Onion to read. Now, this particular book literally speaks in details about gangs. But yet, they (ROSP) constantly keep stopping ULK & Black magazines from coming into this facility for the reasons that they promote gangs or gang activity. It is not fair for these people to try and dictate what we can receive with the money we spend, especially when we have personal property approval slips to receive them. These pages are evidence to support any case brought against ROSP pertaining to discrimination and publication censorship. I have received you all renewal notice stating that October will be my last issue. Well, I would really like to continue my subscription, but for some strange reason, when I attempt to reach out to the company on numerous occasions to inform you all that Red Onion State Prison is stopping the magazine at the first level of a three level panel because they consider it to be promoting violence, gang-related, among other reasons used to reject you all King Magazines to those of us at Red Onion State Prison who paid in advance to receive the King Magazine each month. I am disappointed with the customer services department for not having their staff effectively communicating on this matter. 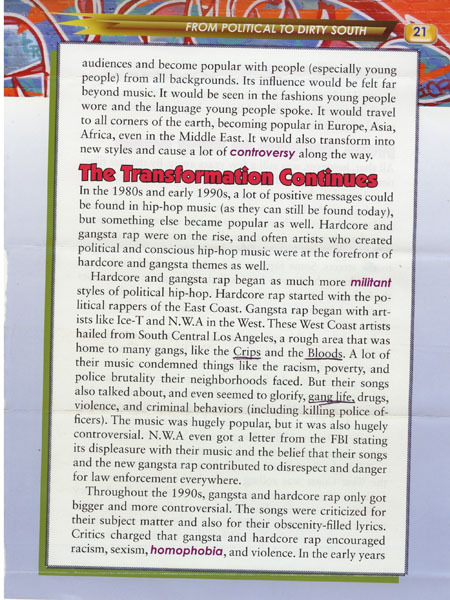 No one responded to my letter and no one at Harris Publishing is showing any type of concern to battle Red Onion State Prison for slandering King Magazine and what you all represent, which is a Black popular culture magazine. Now, like I mentioned above, I'd love to reorder. But the conditions are not stable and you all not showing support to fight the struggle with these people and I'm a customer. This document I'm enclosing is how they categorize King. Now, it didn't spread mainstream through the whole Virginia system yet, but it's coming very soon. So what is King going to do to maintain thousands of their worthy customers?